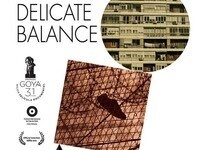 The Hispanic Film Series will present the second film of the series, Delicate Balance, at 7 p.m. Thursday, Feb. 14, in Room 104 Physics Building. The 2016 documentary will be presented in Spanish with English subtitles. This event is FREE and open to the public. Centered around an extensive interview with Jose “Pepe” Mujica, the former President of Uruguay who gained notoriety on the world stage as a rare politician: one that lives according to the ideas and principles he preaches, Delicate Balance is a contemplative essay on the everyday reality of globalization. Mujica’s ideas about modern society, where economic interests prevail over human values, are used to connect three stories: A Japanese salaryman in Tokyo, a sub-Saharan community trying to cross the borders into Europe, a family evicted from their own home in Spain. Three stories intertwined on three different continents. Ultimately, Delicate Balance is a proposal for change, from the particular to the general, that offers a powerful message of optimism for the future. This film is a reflection on the path that the human race is taking, on its habits and its relationship with the world. The Hispanic Film Series is sponsored by Spain Arts and Culture, PRAGDA, Missouri S&T’s College of Arts, Sciences, and Business, and the arts, languages and philosophy department. For more information, please contact Dr. Jorge Porcel, associate professor of arts, languages and philosophy and organizer of the Hispanic Film Series, at porcelj@mst.edu.